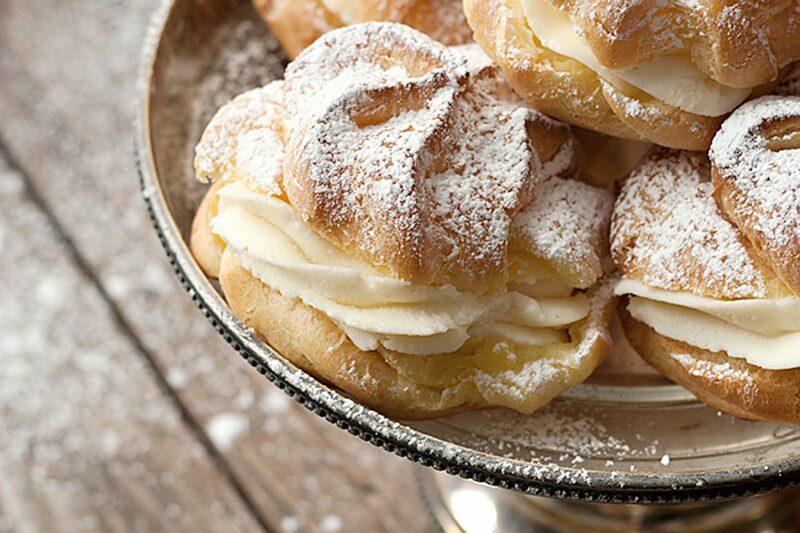 These delicious Cannoli Cream Filled Cream Puffs feature homemade cream puffs, but the traditional filling is replaced with cannoli cream! I love a good cannoli. Sadly, there’s not a decent cannoli to be found anywhere around these parts. I bought some cannoli forms a while back, so I could make my own. That’s an idea that is still stuck on my “to do” list though (there’s just something about those metal forms and hot oil that freaks me out a bit). 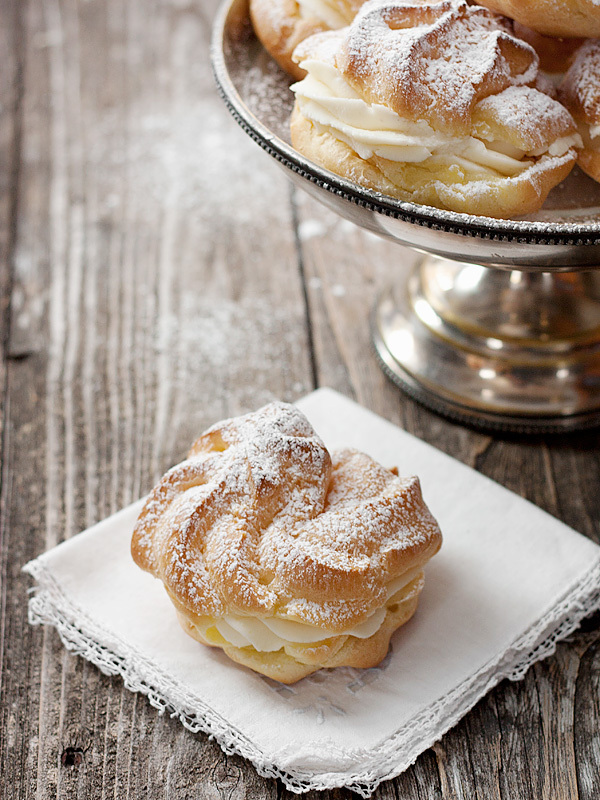 But let me tell you … these Cannoli Cream Puffs make for a perfect alternative. The filling is true cannoli, so let’s just say, if you don’t like cannoli, you might just want to skip this one. For the cannoli lovers out there though, this is a quick and easy treat. I’m partial to a plain-jane cannoli. My husband thinks just about anything can be made better with a bit of chocolate, so he thought a drizzle of chocolate on top would be nice. The nice thing with these treats is that you can make a variety of flavours, to please everyone. In true cannoli style, I think adding some chopped bittersweet chocolate or mini chocolate chips to the filling would be nice, too. A bit of lemon or orange zest would be perfect (and maybe a wee bit on top, too). Scrape in a some vanilla bean seeds or throw in some chopped pistachio. Add a dab of lemon curd or pastry cream in the centre, or flavour the ricotta with cocoa or for a chocolate version. The possibilities are endless. These are so pretty, they would be perfect for a special occasion, I think (like Easter maybe) or follow my lead and make them to celebrate … Tuesday :) They are best eaten shortly after being filled, but will keep, uncovered, in the fridge for the most of the day, if you want to make ahead (They actually stay reasonably fresh into the next day, but they may start to pick up fridge flavours if left too long). I cut these in half and piped in the filling, but you could also pipe the filling in through a hole in the side, so the filling is all nice and neat inside. And of course, if piping isn’t your thing, a spoon works just fine for both the shells and adding the filling. I know mascarpone is expensive. I got a great deal for both the ricotta and mascarpone at an Italian grocery when I was in Toronto this past weekend, but you can also make mascarpone easily at home, as a great alternative (and your own ricotta, for that matter). Takes cream puffs in a different direction, with a classic cannoli filling. 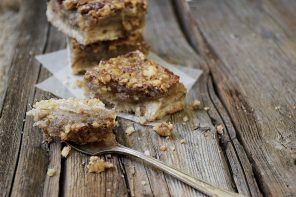 Enjoy them plain or try some of the variations suggested in the recipe. These are best right after they are made but will keep uncovered in the fridge for several hours. Drain Ricotta: Place ricotta in a fine mesh strainer set over a bowl. Press down lightly with the back of a spoon and allow to drain for about an hour before making filling. Preheat oven to 425° with rack in centre of oven, and prepare a sheet pan with parchment paper or a silpat. 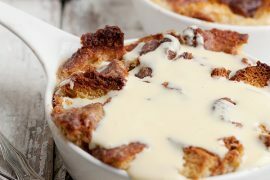 In a medium saucepan over medium heat, combine hot water, butter, sugar and salt. Bring to a boil, stirring occasionally with a wooden spoon. Add flour all at once and stirring vigourously and constantly (really get in there and stir, stir, stir), cook until mixture clears the sides of the pan and forms a ball around your spoon in the middle, as you stir (2-3 minutes). Remove from heat. Add eggs, one at a time. After each egg addition, stir quickly and vigourously, until the egg is combined (it will start out as a slimy mess, but just keep stirring and it will come together). Repeat with each egg. Once all eggs are added, stir a bit more until smooth and shiny. Add batter to piping bag fitted with a large star tip (alternately, drop balls of batter onto prepared pans and roughly shape with the back of a spoon). Pipe batter onto prepared pan, leaving about 2 inches between each one. Bake for 15 minutes at 425°, then reduce heat to 350° and cook for about another 10 minutes, or until golden and hollow-sounding when tapped. (*Do not open oven while they're cooking.). Mine were about the size of my palm. If yours are bigger or smaller, allow a bit more or less cooking time. Remove to a cooling rack to cool completely. In a large bowl or the bowl of a stand mixer, combine filling ingredients (except chocolate chips, if usinand beat well until light and fluffy. Add filling to piping bag fitted with a large star tip. 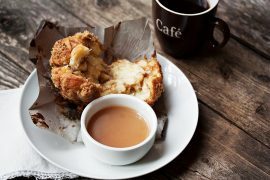 Cut pastries in half (or use a sharp knife to cut a small hole in the sidand pipe either a ring of filling around the outside of the bottom half or fill the cavity with filling. If using chocolate chips, you'll need to go the cut in half route. Simply sprinkle chips on top of filling before putting the top on. Sprinkle generously with icing sugar. Serve immediately or refrigerate uncovered for up to 6 hours. Hi Jan and yes, I’m sure the tubes seem more tricky than they are in reality :) I love the combination of ricotta and mascarpone in cannoli, too! They look delicious !!!!! I am going to have to try these !!!!! yummy & Thanks for sharing the recipe!!!!!! On the first tray I made 6 puffs, and baked as the recipe says. I feel like they were too crunchy for me, so on the 2nd tray I baked for almost 15 min in 425 and they turned out good, not too crispy and baked well. Also, 1 cup of each chease should be enough, since I had leftover filling and my puffs were full completely. I feel like the filling was kind of heavy as well and not sweet enough. Maybe adding whipped cream to the mixture would light it up? All in all, it’s a very nice recipe, I had a lot of fun making it! First time I’ve stumbled upon your blog (via Twitter) and I had to pin this recipe. What a fabulous idea to combine these two delectable treats! I’ll be making them gluten free so the whole family can enjoy. Thanks so much, Celeste. Let me know how they turn out! Hi, I was wondering if it was necessary to have the 1/4 cup of ricotta and mascarpone cheese. The store I go to only sells 1 cup packages and it’s a bit expensive. Is there any way I could make it with just one cup? Hi Rose. I hear you. They are both expensive! You can definitely scale ALL the ingredients for the filling down by 1/4, so you’ll just use a cup of mascarpone/ricotta, 6 Tbsp. icing sugar, pinch cinnamon and a scant 1/2 tsp. vanilla. Just bear in mind that you may not have quite enough filling to fill all the cream puffs. 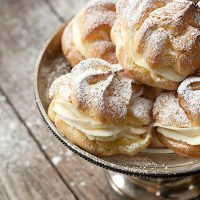 The cream puffs can be made ahead and frozen and filled once defrosted. An easy way for a quick dessert. Don’t like cannoli?…try whipping heavy cream with small amount of powdered sugar and once whipped add a bit of strawberry jelly. Makes the cream barely pink and adds just a nice light strawberry flavor. Delish. These look so delicious! I love Cannoli and Puffs both and of course with a Cream on it make it an extra fun treat! What do you mean by icing. Do you just use confectioners sugar or mix it with something. Hi Geri. I left my cannoli plain. The other additions were suggested for variations if you wanted to use one or the other to change up the filling. Hi, I tried making these, and I ended up with a lot of butter on my tray oozing out onto the parchment. I was wondering if you knew where I went wrong. Hi Roshni, I have no idea. I have never had that happen. The only thing I can think of (assuming you used the correct amount of ingredients), is that you didn’t cook the butter and flour long enough. It does need to be stirred for quite a long time (2-3 minutes). These are most amazing, made them numerous times. People keep raving about them and want the recipe. Thanks so much for this recipe. Hi Jennifer, those just look amazing!! I just have one question though, you the filling part – you said – to make a hole on the side or to cut it in half – so to put the filling (as is shown in the picture) you need to make a whole on the side &/or cut it in half? I thought you just put the pastry upside down, and put the filling on the bottom, and just put the other pastry on top – or am I wrong? – because it seems like that! Hi Munira, You can do it either way. I find it easier to just cut it in half. I pipe the filling on the bottom and put the lid on, just so that I can see the pretty filling. The other way is to not cut in half and put a hole in the side and to stick the piping tip into the hole to fill the cream puff with filling. No problem, Tess. To shape with a spoon, you’re really just spooning a mound of the dough onto the pan. Actually two spoons work best – scoop a mound with one spoon and use the other spoon to scrape the dough off the first spoon. Aim for a mound a bit bigger than a golf ball. Hope that helps. 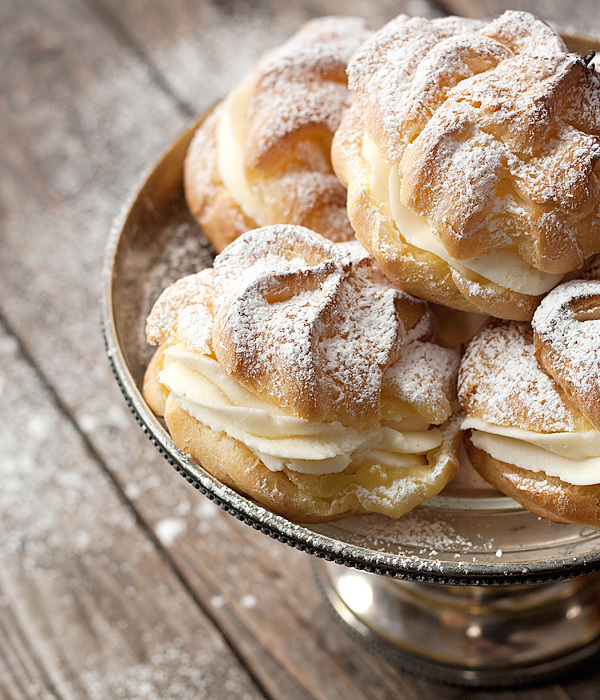 Jennifer, your Cannoli Cream Puffs are gorgeous! (Um, why haven’t I thought of this?) I adore cannoli and would definitely add some chopped bittersweet chocolate and pistachios to emulate the ones I fondly recall from my childhood. But, would definitely change things up seasonally. I agree with you…the very thought of those metal cannoli forms and hot oil is quite terrifying, Murphy’s Law and all. Lovely food styling and photography, too. So happy to have found your sweet blog! Thank you so much Stacy. Appreciate your kind words. I’m a big fan of your blog, as well. You’re welcome and glad it worked for you the second time at least :) (they look good!). Hi. I’m on my second attempt at making the “puff”. For some reason they are coming out crunchy on outside but kind of gooey inside. Shouldn’t the consistency of the puff be “flaky”? Hi Lori. The inside should be almost hollow and will be slightly moist (it will dry as it sits). Be sure to poke a hole in the side as soon as they come out of the oven, to allow the steam to escape. Also, you may need to cook a few minutes longer if it’s undercooked inside. These look gorgeous. I was looking for a good cream puff for Easter and these look outstanding. Did you just make a big “blob” when piping the dough onto the baking sheet or did you kind of “swirl” (pipe) it into a circle? Also, you mention making them in advance, possibly. You don’t find that to make them soggy? Especially, by putting them in the fridge? The possibilities are definitely endless jennifer!! My husband ate so many of these, I suspect they’ll be making a repeat performance soon. So I’ll be trying some different ones, for sure. I just finished making your Cannoli Cream Puffs. Man oh Man they’re goooooooooooooood. Thank you Thank you Thank you so much. Beautiful shots, Jennifer! Will you give me a food photography lesson? :) There used to be a little place here in town that made cannolis… this sparked my taste memory. These sound more simple than molding, for sure.. and so pretty! Yum! Thanks Sophie. I had cannoli on the brain, since we were in Toronto last weekend and I indulged in a few there, since I can’t get them here (that and a huge cupcake from a lovely cupcake shop). Maybe it’s a good thing these things aren’t too handy. So pretty, and I bet they are absolutely delicious to bite into – is that mascarpone in the filling? Perfect.I gave up on finding good cannoli where I live, too. I have never tried cannolli but these puffs remind me so much of the divine cream puffs I enjoyed while in San Francisco, that these are surely fantastic! Thanks Liz. I’m a big cannoli fan, in any form. These sound delicious Jennifer! I’ve never made delicate cannoli before but I’ve always wanted to – now I have no excuse!